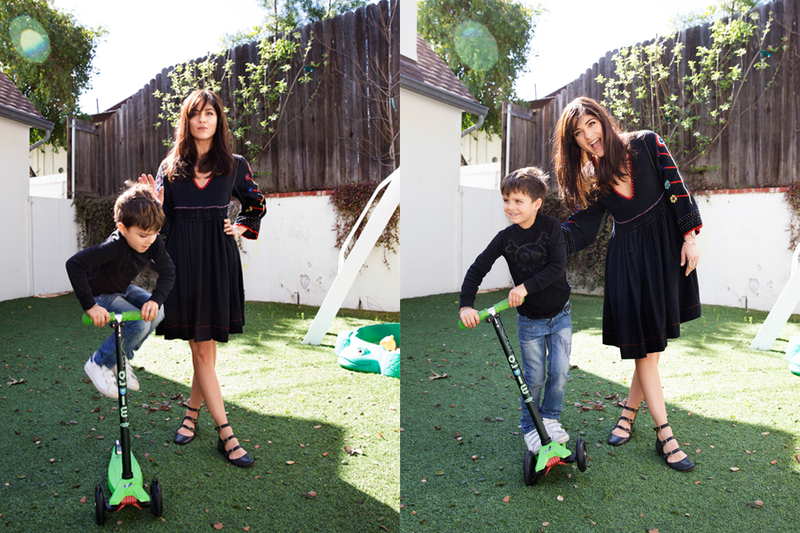 Selma Blair, Actress, Mother of Arthur 5 Years Old, Los Angeles. Whats your most cherished memory on your pregnancy? Pregnancy agreed with me. I so loved having my baby inside me, knowing I didn’t have to ask for help in caring for him or deal with any scheduling. It was just us. One of my most cherished memories is of swimming in the ocean near Tulum. I had gone there as a last vacation with Jason, Arthur’s father. The waves were gentle with large swells, perfect for floating. It was heaven. My belly was weightless and it just felt so terrific and invigorating and relaxing. The Tides resort didn’t allow children so it was just the ocean. I stayed in it all day. Jason said he had never met such a dolphin. Arthur and I were just totally relaxed and happy. Together. I found out I was pregnant at 6 weeks. I had to be admitted to the hospital for a severe kidney infection that had been paining me for a week. I took a pregnancy test before I decided to go there and discovered I was, indeed, pregnant. Jason and I rushed to the hospital where I stayed for a few days, medicated and unsure if the baby would be alright. I was on antibiotics the rest of my pregnancy and had complications with that and worries if that would be hard on the baby. But I had no choice. I had to make sure the kidney could remain infection free. But the truly most difficult part of pregnancy was at the very end. Because of some kidney complications, I switched from my beloved OBGYN to a new one with a brusque manner. My due date was July 6 2011, but I had no signs of needing to give birth a couple weeks later. I felt fine. The midwife said I had to do a hospital delivery because I was so past my due date. Disappointing but fine. By July 22nd, the doctor was saying it was best to induce. I tried herbs and castor oil and anything to get labor going. Nothing. I felt I didn’t need to give birth yet. I had enough amniotic fluid, but when you get in the hospital system, you can get thrown. I was induced on July 23. 37 hours of full on labor without dilating. After 7 hours, this new doctor said I would have to do a C section. I kindly fired him at 2 am. Realized I was in a pickle, and called Dr. Crane, my trusty original doctor. He drove in from Palm springs, led me into a natural delivery. It took 37 hours until I finally accepted an epidural so I could sleep. It only took on half my body. I wound up having two more. But when I did dilate, pushing and giving birth were a breeze. It was nothing. I hadn’t slept in three days. Two of them in full labor and I was wrecked. Exhausted. And there I would stay for years. My advice is to get a good nights sleep and go in next day if you must be induced. Do not do at night. Lord. But Dr. Crane was a saint and Arthur arrived healthy and hungry. I came across some of your pregnant bikini pictures and wow you looked fit! What was your work out routine? L.A must have way too many places and options, what was yours? To stay in the best frame of my mind and fitness I practiced yoga at Golden Bridge three times a week at least and walked a few miles every day. Alicia Silverstone and I were pregnant at the same time and had a very supportive hike or two. They were very nurturing, to hike and share pregnancy worries and questions. We both planned home births. I gained so much weight while pregnant cause I had to eat every half hour or I felt very faint, but I didn’t think much about it. I didn’t eat any gluten or sugar while pregnant. None. Except some fruit. I spent a lot of time in paradise cove swimming with friends and hiking Fryman canyon or just strolling. Everywhere. You dressed from floaty dresses to skin tight leather pants during your term. you give at all into pregnancy dressing? What was your favorite thing to wear? A strange thing happened when I was pregnant. Black clothing. I didn’t want to wear it very much. I felt so joyful and giggly almost. Good hormones. I wore things I wouldn’t be caught dead in now. Some silly dresses and such that only made sense with this big belly. I wore maternity jeans, white and blue, but that was kinda it for maternity. A few companies sent me some good things for the time but I did prefer leather leggings which stretch and go with anything. The Row was in my closet and i just stretched them and stretched them with the weeks of baby growing. Anything went . There was one pregnancy item I craved – and this is nutso – Celine wooden wedge sandals! I thought they would be ideal. A flat wedge and I could still have height. Summery and cool. Jason bought them for me as a gift. Bless him. We went to a doctor appointment and I couldn’t take three steps without toppling. Terrifying. I never wore them again. Platform wedge and pregnancy. Not for me. Not even now. What do you love the most about being a mother? Motherhood. It was unfathomable to me. I thought I would adopt an older child. Even as a little girl, that was my plan. So, the infant years were the most challenging. Bleary eyed mom carrying a wide eyed baby. Everywhere. But I love how it has changed me. I was always very self centered in my life. And perhaps I still am, but now that center is my son. I have always been a vigilant mom, always on top of things until I finally wore down. It was the worst of motherhood, the exhaustion and anxiety. I had severe postpartum depression but I was always hands on. Let the night nurse go after one hour. Felt too strange to have someone with us. I wanted to do it all and was a single mom early on. I had a few friends who really were there, but I think I had to ultimately go through it on my own. To learn to take care of myself better. It was heaven and hell. I went back to work after six months. The days were very long. Arthur nursed four times a night and up early and I was going to this job and trying to show the best to my son. He started breath holding and I was always anxious he would do with a nanny while I was at work. I rushed to get home. I couldn’t sleep. I was nursing all the time. I was alone. I say this because I feel it must be happening to so many other women and I felt it would never get easier. But he changed and I changed. Heaven. Now motherhood is beautiful. I am patient and loving and we have a ball together. He is kind and thoughtful and mischievous, but he travels well and loves trying different foods and hanging out with friends. Mine and his . I appreciate every moment now. I have a person in my life that I will always love no matter what, and wish him only the best, unselfishly. And I found out i could get through some things I never imagined I could. I read you said "It takes a village, and it's really hard to be the village on your own. But it's still amazingly rewarding.” How do you manage work and mommy time? It should take a village. It just isn’t always how it works. And for single mothers, it seems especially villageless. Just less people around to attract more people in the circle. Working for a year every day when Arthur was a baby was so hard on me physically, but emotionally, I knew I had to support us and it was necessary. As he got older, and showed real anxiety when I left, it became the guilt thing and I cried when I left for work. And felt guilty cause i just wanted to get home for bedtime, but the hours of an actress don’t work like that. I don’t run a business in the conventional way so I decided to only take a few jobs. I shot a pilot in New Orleans and Arthur had a grand time. But I was beyond tired working nights and being with Arthur in the day. I took some time off, and only worked when it worked for the both of us. A luxury, truly. Because in those youngest years , the challenge was keeping a home base to set up a sense of security but also staying a bit in the loop of working to keep a professional sense of self. I will probably always have guilt when I am not with him when I sense he wants me, but he is five now, and he is building a village of his own friends and a circle with his dad. If not working, can you describe a day in your life? We wake at seven now (Sometimes six still) with the daylight savings and he helps make breakfast. Avocado with sea salt and olive oil. Tomatoes and basil from the garden. Cucumbers and an egg or something simple but with some variety. I shower and drop him at school and head out to the barn. I brought home my horse, Dark, last year, from being out to pasture so I could have time with Arthur. It takes 45 minutes to get there so I spend as much time as possible riding. Dark is having some issues, so I jump around another horse and just relax out there, walking and feeding the horses. I can read scripts and do voiceover auditions on my phone there so it is a good set up. I head back to get Arthur and its dealers choice. We go swimming or ride roller coasters at Universal, or just do pottery or some other crafts. He loves to draw so he will teach me for hours sometimes. Once a week, I head right back to the barn for Arthur to get a lesson in and we will stay out there until evening. Those are the best days. We grill with friends a couple of times a week. We rarely stop. Always something together and I will enjoy it while he still likes to hang with me. I have extra car seats to take his friends to play too , so my afternoons with him basically are very mom oriented. I try to get work related things done while he is in school. But sometimes he joins. Tomorrow I have a fitting at The Chateau, where he will be fine exploring with a friend. But he will stay with a nanny if I have to leave at night. I have a full time nanny, but probably use her two hours a week. But when I am on set, she is in charge. I am learning to let the village take over. Being a single mom has some great advantages, as we have so many moments together, without having to share a schedule with another parent on our own parent time. It takes some planning, but we can get away so much. We both think the greatest indulgence is a good hotel, So we go almost every weekend we have. The Beverly Hills Hotel and its “credit card” for kids is a real win for my son. He is charmed. The Chateau Marmont is a standard getaway for us and my home away from home. When I pick him up on fridays, he buckles in and asks with a big smile “Can we go to a hotel?” He loves Terranea in Palos Verdes. Anywhere near the water is especially cherished and there is so much property to explore. Tide pools. The best. He also loves The London because he likes the shops nearby. Malibu Beach Inn and Casa Del Mar are some other favorites. Dinners out in Los angeles happen often. I don’t really like to cook for two and we both love to people watch so Ysabel is always pretty when we want to sit by the fire. Au Fudge is really sweet and I can sign him into the nanny care craft room with a pal so he has his own adventures. Jon and Vinny’s, we both agree has the best pasta and pizza and we enjoy the energy of being able to watch the kitchen. Kiwami in Studio City is his favorite for sushi. Seaweed salad and a mushroom and spinach dish are ordered in multiples so there is plenty left over for his lunch the next day. Camping is an all time, absolute hit. El Capitain Canyon, with a friend to adventure around with, and Carpinteria with his godmother and me are also blessed memories. We are into outdoor grime as well as luxury and corny ghost stories wherever bed time is. What would we find in your bag? In my bag… A Rubiks cube for the kiddo. A Pokemon guidebook. Again, his. Studies endlessly. Cutler and Gross reading glasses. Clinique high impact extreme volume mascara. A must. Who knew? I always have a few rolling around somewhere. Moleskine notebooks for him and an Hermes one for me. An hermes makeup bag, the orange always gives me a lift. My favorite makeup must haves are Dior lip gloss, Laura Mercier rose gold caviar stick for corners of my eyes. Madina highlight stick. Bobbi Brown tinted eye brightener. Kevyn Aucoin, the creamy glow cheek and lip compact. Marc Jacobs liquid eye liner in black and Kajal sticks from india for inside my eye lid. I always have a book. Right now I am carrying IN GRATITUDE by Jenny Diski. And a Byredo scent and Elizabeth and James Nirvana perfume stick balm to counter if I go overboard on floral or just want a grounding scent on wrist. Your favorite movie to watch together? We have loved watching the Gene wilder Willy Wonka movie since he was a year old. That and Coraline. Never gets old. Arthur loved Hawaii as a vacation spot, but he is so spoiled by hotels and Los angeles that he though The Stein Eriksen lodge in deer Valley was pretty spectacular. He is a natural skiier and I loved being able to teach him that. I grew up in the cold and skiing was the big sport. You still look 15!!!! We all want to know your beauty secrets. What are some of the products you can’t live without? Still look 15! maybe with a filter or in the dark! Ha! But I do have a pretty full face, so it can stay somewhat youthful in spite of the newly formed lines. I had terrible acne when Arthur was one until he was three or more. I tried everything. I was so puzzled. Finally, I found a place called Pamela’s Skincare on Sunset through my friend, Kelly Atterton. She whipped my face back into shape. she has her own anti viral anti bacterial potion that just saved me and a cinnamon and pumpkin kind of peel that burns like all get out but transformed my skin. I have never had a filler or a botox or anything, and I wish I could find someone I could absolutely trust to do a little, a very little. I am wary for my kind of face. But to keep it clear, I must stick to a regimen of washing every night and using almond oil or vitamin e to get every last bit of dirt and makeup off. That is key for me. My hair is still thick and grows super fast. I like all Oribe products, but Pantene from the drugstore gives it a bounce and volume that nothing else does! Love it. Favorite beauty treatment? Favorite Work out? I love a massage that is totally deep a couple times a month. He comes to my house and will do acupuncture and cupping if need be. I go to bed as early as possible. And I may sometimes work out with Jason Wimberly or Ryan Scott Vandyke but I prefer to just horseback ride for exercise and fun. Things need to be enjoyable now, unless I am preparing for a role. Any future or ongoing projects you want to share, or charity you support? So, I have had the luxury of staying with work as minimally as possible, but those days are over. Arthur is going to be in Kindergarten next year and it is time to focus on me more. I have a movie coming out with Nicholas Cage called Mom and Dad, a horror satire. And I just filmed a part in the Netflix show, Lost in Space. I am optioning a couple books to produce or perhaps star in. Not certain how that will turn out. I am probably sure to get out of this lovely, crazy, wonderful, mommy bubble soonish, but when ever I am with him at bedtime, I will still sing him his favorite lullabies…. Coldplay’s Yellow and Lada Gaga’s A Million Reasons. I apologized to my son for my voice the other night, and he said “NO!!! you have an amazing voice mom” He must really love me as much as I love him.